Among dentists, porcelain veneers are often referred to as “instant orthodontics.” Why? These cosmetic coverings solve a number of smile problems—including teeth that are slightly crooked—in just a matter of a few visits. Once Dr. Saran permanently bonds your customized veneers to your teeth, you’ll never think twice about the imperfections that used to make you hesitant to smile in social or professional settings. Why Choose LIC Dental Associates for Porcelain Veneers? 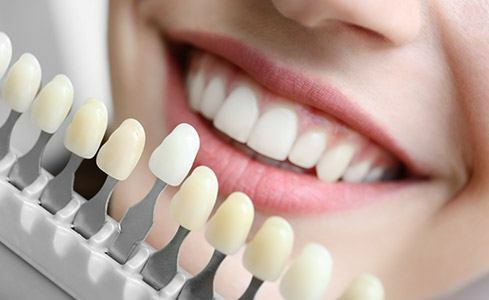 Porcelain veneers, also called dental veneers or just veneers, are thin layers of dental porcelain—or sometimes composite resin material—that are shaped to precisely cover the teeth in your smile zone. 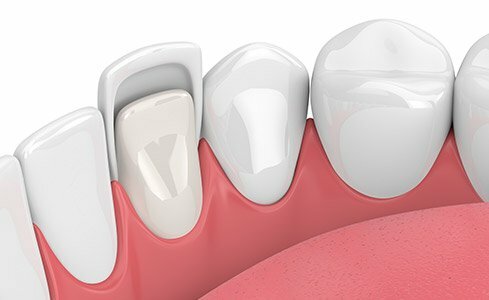 Dr. Saran designs each veneer to correct one tooth’s imperfection; together, your veneers look just like individual teeth that give you a unique and beautiful smile. Because Dr. Saran designs your veneers with the correct size, shape, and color in mind, each one can compensate for a combination of flaws. To begin the process, you’ll meet with Dr. Saran to discuss your smile goals and so he can thoroughly examine your teeth and gums, which must be in good condition before beginning any cosmetic dentistry procedure. Then, we take a complete set of digital X-rays, photographs, and molded impressions of your teeth. Together, these help Dr. Saran design veneers that fit perfectly and look natural in your mouth. At your next visit, Dr. Saran will prepare the teeth to receive veneers. Under local anesthesia, he removes a very thin layer of each tooth’s enamel. This step is done to ensure that the veneers lay flat and even with your other teeth. This is a permanent alteration to your teeth. 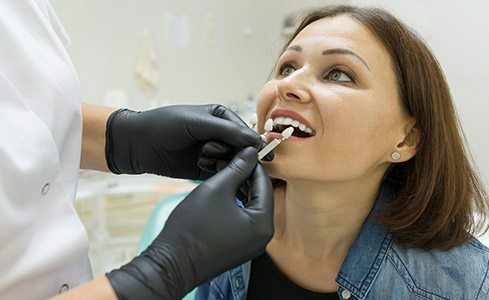 Once completed, he places a set of temporary veneers to protect your prepared teeth and to help you adjust to the feeling of veneers in your mouth. The third and final visit is when your permanent veneers are set in place. Dr. Saran will examine the finished restoration and make sure the fit is to his high standards. Your porcelain veneers are cemented to each corresponding tooth and the adhesive is quickly dried with a special curing light. You’ll leave LIC Dental Associates with a smile that you will never again hesitate to share! Contact LIC Dental Associates for more information about porcelain veneers or any other cosmetic dentistry treatment you are considering. We serve the areas of Long Island City, Astoria, Sunnyside, Woodside, and beyond Western Queens.